Melville's 1853 short story is a social critique of labor, commercialization, industry, and the relationship between work and the human spirit. Subtitled "A Story of Wall Street," the story centers on a Manhattan-based lawyer who hires several scriveners (legal secretaries) to work for him, including a man named Bartleby. Initially, Bartleby seems to be doing fine and is adjusting well, but soon when asked to work particular tasks, he responds with "I would prefer not to." The unnamed boss tries time and time again to get Bartelby to work--mixing up his assignments, trying to make tasks more appealing, adjusting terms--but to no avail. Each and every time he is told to work, Bartelby responds, "I would prefer not to." Because Bartleby will neither work nor leave, his boss tries to fire him and then forcibly remove him from his office. Even the police cannot get Bartleby to either work or leave; his passivity is all-encompassing. The story reaches its climax as the narrator determines something must be done to rid himself of Bartleby. This short story is quirky, ridiculous, and yet full of social insight. 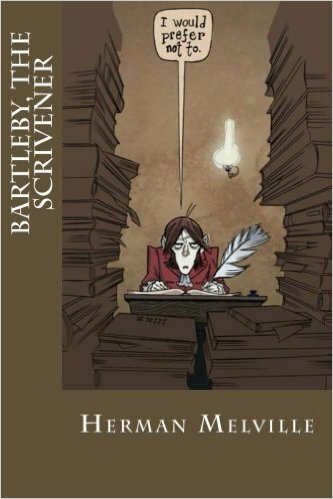 I laughed out loud at Bartleby's irrational behavior and at the same time really wished I had been in a classroom and been able to discuss the story with peers: Is Bartleby's apathy a product of his work environment, a commentary on his generation, or suggestive of mental illness? Are his boss' actions justified, insensitive, or not punitive enough? Bartleby's refusal might suggest strength and resolve and yet he's endlessly weak and indifferent. Melville invites readers to question if man is failing the system or if the system is failing man.